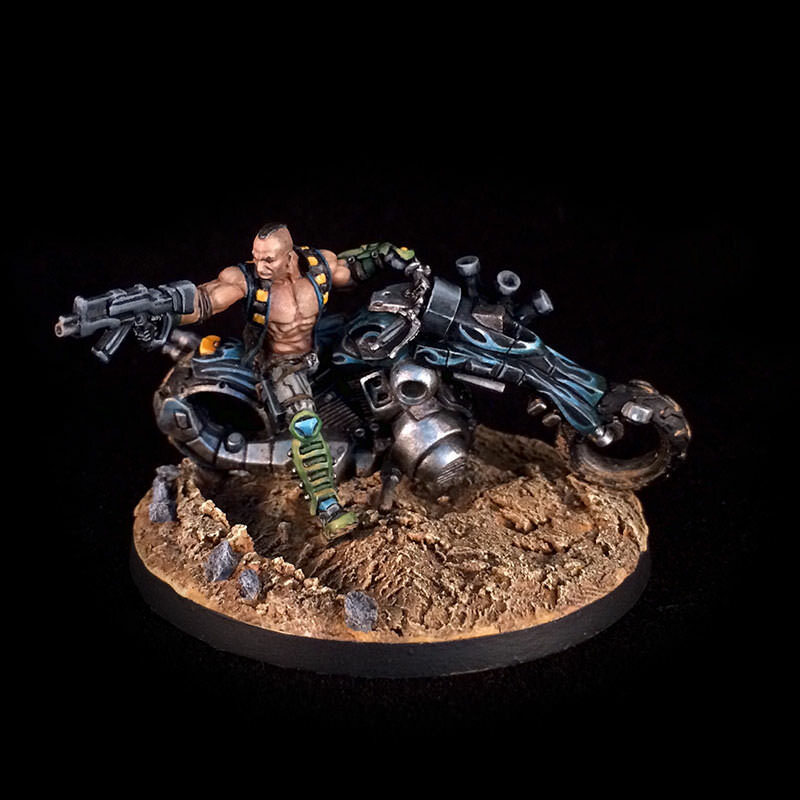 The Kum Biker is probably one of the nicest sculpts I've ever painted. The detail is amazing and the tension in the biker's face and neck as he turns around to aim his rifle are really nicely done. As with almost all other Infinity minis I've painted, he is rife with surface detail. His pants have debossed lines, his jacket is marked off with squares and edging, his greaves are chunky with many different surfaces to paint. What's really nice about this is that, to a certain extent, it's easy to see where all the detail should be. The downside is that it requires a lot of self-control to keep the choice of colors simple and not to bring in different tones and hues for all the different surfaces. 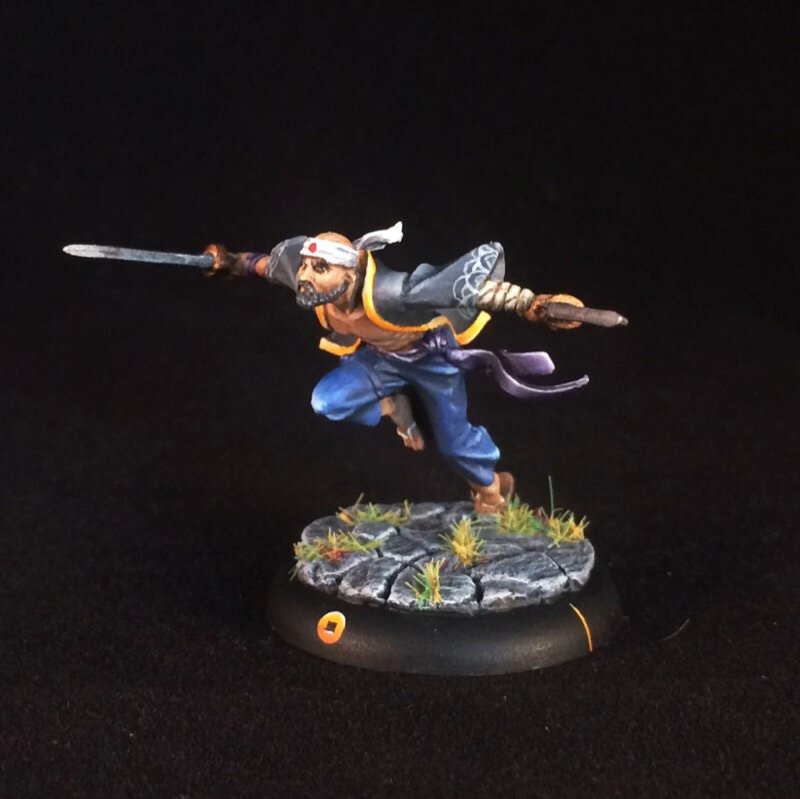 By way of contrast, Senpu, like many of his Silvermoon pals, is a model of simplicity: pants, jacket, skin-tones and no debossed or sculpted embellishments to clue you in on where the extra details should be. That's not to say that the sculpt isn't wonderful - his robe billowing out behind him as he leaps dramatically forwards make him fun to look at, paint and play on the table. However, where it's possible to get lost in the detail of the Kum Biker, I felt that I wanted to bring a little bit more detail to Senpu and so added a little scalloped repeating pattern to his robe. I definitely don't think one approach to sculpting is in any way better than the other. Each has their distinct advantages. After having painted so many Infinity models last year, however, it did give me a new appreciation for the simpler sculpts in the Silvermoon line. Manu's big belly is practically a blank canvas, calling out for those tattoos. And with Fitiaumua newly arriving through the mail just the other day, I'm looking forward to doing some more (if Senpu was simple with pants, jacket and skin-tones, "Fiti" isn't even wearing a jacket! ).